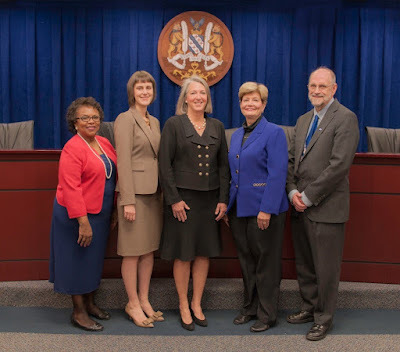 Rockville Mayor Bridget Donnell Newton and Councilmember Beryl Feinberg are seeking answers as to why the Board of Supervisors of Elections is refusing to appear before the City Council to brief them on the switch to voting-by-mail, that will occur with the next City election in 2019. Newton and Feinberg queried Deputy City Clerk Sara Taylor-Farrell and City Attorney Debra Yerg Daniel about the delay in updating officials on their plans and progress on the new voting system. "I'm a little concerned, because this is a huge deal," Newton said. Feinberg too expressed concerns over the delay given the enormity of the task ahead, calling the new system a "sea change" for the city. She said she wanted to know where exactly the Board is in implementing voting by mail. Daniel said the Board technically does not have to appear at the request of the Mayor and Council, because they are a separately-chartered body in charge of elections. Staff and Councilmember Virginia Onley said the Board is understaffed, and that their request for additional staffing funds from the Mayor and Council may have to be acted upon before the Board will agree to appear. Onley suggested discussing the staffing problem with the Board, even if the conversation must be held out of public view. "If it's offline, then let's discuss it offline," Onley suggested. Daniel said an offline discussion could be held in closed session. The Mayor and Council have a closed session today at 4:00 PM at the Cottage at Glenview Mansion, at 603 Edmonston Drive, where the matter may now be discussed. That closed session is, of course, closed to the public. They will also be discussing something related to the Office of the City Clerk, the original reason for the closed session. How come you never report County Council business with this degree of detail? Are you kidding me? No other news outlet covers the criminal activities of our County Council in more detail than mine. Now if you're seeking praise of our corrupt County Council, you've indeed come to the wrong place, but fortunately you have several other obsequious MoCo cartel-controlled media options.